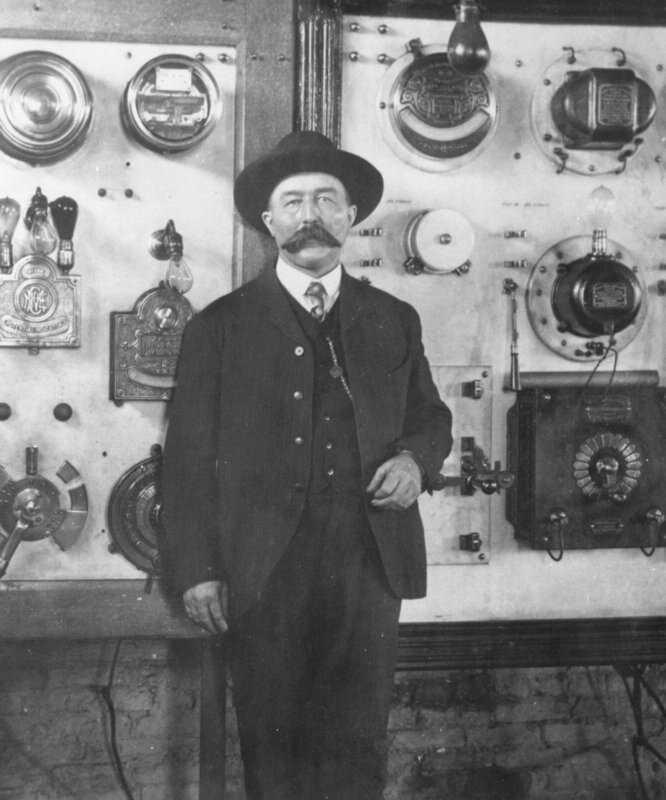 Ed McCauley inside Reedsburg Power House, early 1900s. Early pioneers who arrived to settle Reedsburg in the 1840s, brought their illumination with them. They used tallow candles to light their homes after dark, however, most early residents went to bed when the sun set, so artificial light was not an issue. Kerosene lanterns were a great improvement as they provided more light and could extend the days’ activities well into the evening. These lanterns were also attached to buggies and buckboards to guide travelers safely home after dark. Street lamps were placed on poles at various locations in the city and ran the length of Main Street. Local residents would bid for the right to be “lamp tenders” and the job was let for $100 per year. A 1941 Reedsburg Times-Press article described the duties of a “tender”. “The men with their small step ladders, oil can and cleaning rags, made the rounds of the lamps and kept them in efficient working order." These lamps furnished illumination for the streets of Reedsburg until the mid-1880s. In 1886, E.F. Barker, owner of a furniture store, campaigned to electrify the city’s commercial establishments. J.G. Heaton, owner of the grist mill, installed a dynamo, water powered by the nearby dam, and sold electricity to local businesses only. The following year, Heaton began installing power poles on the north side of Main street. He was ordered to stop when the city decided to enter the same business. When the time expired for Heaton to remove his poles, they were still ﬁrmly in place. C.A. Clark. a city worker, was ordered to remove them. “With a crowd of men, he went about and chopped the offending poles down,” noted a 1941 Times Press article. The Baraboo Electric Light Company was hired to install the electric plant, which was located south of the railroad tracks, on the south end of Webb Avenue. The coal-powered steam generator was located near the rail line to facilitate easy access for shipments of coal. Poles and wires were strung along the streets and alleys of Reedsburg’s business district during the spring and summer of 1895. The ﬁrst electricity ﬂowed that same year. Initially, the power was turned on only during the daytime. Between the hours of 8 and 10 P.M. the superintendent would cycle the main switch at the powerhouse several times, warning patrons that the power would soon be shut down for the evening. As the citizens of Reedsburg entered the new century, more electrical appliances became available to customers, the washing machine being one of them. On Mondays and Tuesdays, the power plant increased its production so that housewives could do the laundry with their new motorized washers. Other electrical appliances making their appearance were toasters. irons and stoves. Over the following decade, there was more demand for electricity and the city power plant was hard pressed to provide it. The old wiring and insulators were also increasingly susceptible to lightning strikes causing long power outages. By 1909 the Reedsburg utility was supplying electricity to 450 customers. A solution to the city’s problem was right next to the river. The Woolen Mill had been producing its own power to run the looms for years and in 1912, the city began purchasing electricity from the mill during peak hours. No longer was the power turned off at dusk. As the city continued to grow, the demand for electricity grew with it. In 1918, a representative of the Wisconsin Power, Light and Heat Company approached the city council and proposed that they purchase power from their lines. Electricity would be produced at the new Prairie du Sac dam and routed through Reedsburg then to Baraboo where it would interconnect with the line from the Kilbourn Dam. In January of 1919, the deal was struck and Heaton’s antiquated local power plant was shut down for good. In 1922, citizens were demanding the city do something about the inadequate lighting on the streets of the city. For $5,000 there could be abundant lighting and canvassers began soliciting private donations to fund the project. “The N.O. Nelson Electric Co. last week placed a sample pedestal and light in front of its place of business and it has been ‘lit up’ every evening since, just as a sample of what the street would look like if it is decided to install the white way," noted an article in the May 5, 1922 issue of the Reedsburg Times-Press. It concluded by demanding, “Let there be light!” In 1925, that dream became a reality, when electric street lights were finally installed from the bridge to the boulevard.